Update: 9/11/2013 Xolo Q2000 has been priced at Rs. 14,296 which is way below our expectations and this makes this a good value for money Phablet, You can read our Xolo Q2000 Quick Review for better insight. The tablet can be bought from online retailer Flipkart. Xolo has listed Xolo Q2000, a 5.5 inch Phablet on its official website! This Phablet runs on MediaTek Quad core chipset and supports USB OTG. Xolo will also provide an OTG cable with this phone inside the box along with a flip cover. The body design seems like any other conventional Xolo smartphone from the images on the official website. The Display of this phone, as mentioned, is 5.5 inches in size and sports 1280 X 720 pixel HD resolution which will give you sufficient clarity 267 pixels per inches. MediaTek MT6589 chipset works well with 720P resolution something which can’t be said for full HD resolution. The processor powering this Phablet is MT6589W 1.2 GHz Quad core processor and the RAM capacity is 1 GB which is in range with the expectations. The GPU used is Power VR SGX544 MP clocked at 357 MHz (similar to MT6589T) and internal storage is 8 GB. You can extend the storage further to 32 GB using a microSD card slot, a privilege that its main rival Micromax Canvas Doodle 2 is not offering. The primary camera is of 13 MP and the sensor used is BSI 2 sensor. The camera is supported by LED flash for low light photography. This camera is capable of full HD 1080p video recording. A front camera of 2 MP is also present for video recording. 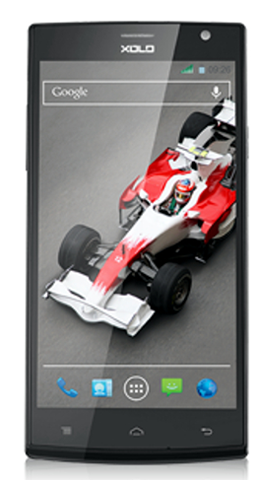 Xolo Q2000 runs on Android 4.2 operating system and supports Dual SIM functionality. The Battery capacity is 2600 mAh and Xolo claims this will give you up to 12 hours of talk time on 3G and standby time of 577 hours on 3G which is pretty impressive. You will get a web browsing time of 7.5 hours on 3G . Video playback time for this battery is 4.5 hours. Connectivity features include 3G, WiFi 802.11, Bluetooth, GPS and USB OTG. We expect this phone to be priced somewhere around 19,000 INR. This phone will be a good option for those who wish for that extra screen real estate. The hardware specifications look pretty good on paper and the promised battery backup is certainly above average. The device also manages to keep the weight light at 180 grams considering the screen size.